Seattle DJC.com local business news and data - Environment - Would World Cup games or art make you hang out in an alley? Would World Cup games or art make you hang out in an alley? 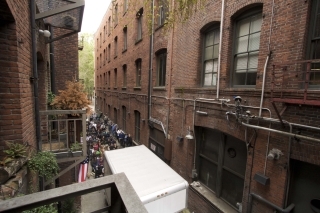 Crowds come daily to watch World Cup games in this Pioneer Square alley. Jones and Jones is doing pro bono design work for a new art installation, which is also intended to help people see that alleys can be gathering spaces. Since the World Cup games started, crowds have gathered daily in Pioneer Square's Nord Alley to watch soccer matches. The idea behind the viewing parties is to show Seattleites that alleys could be usable, livable space. Nord Alley is east of First Avenue South, connecting South Jackson Street and South Main Street. Todd Vogel, executive director of the International Sustainability Institute, said crowds gather each day at 11:30 a.m. to watch soccer teams play on a 100-inch TV screen set inside a U-Haul truck that is parked in the alley. Vogel said the U-Haul costs $9 per day, compared to the alternative of a $30,000 projection system. The first day, 140 people turned up for the game. Since then, Vogel said between 60 and 100 people have watched each game. The effort is being run by the Alley Art Project, a group that includes the International Sustainability Institute, Jones and Jones, Glasshouse Studio and Groundwire. Alley Art Project has organized art installations in Nord Alley to create pedestrian interest and now is putting together a permanent installation funded by a $15,000 grant from the city's Department of Neighborhoods. The installation was designed by Jones and Jones, which did the work pro bono. The installation involves a series of perforated panels that will be mounted at varying heights along both sides of the alley. Panels are expected to be made of corten steel, which rusts in an attractive way without being damaged. One type of panel would hold art. Another type would hold trash and recycling bags for alley offices, getting them off the ground and organized. A third type would have plants growing on it. The waste panels would be located near the ground. The green panels would be high on the walls and the art panels would be at or above eye level. Waste panels would be padlocked, so only businesses in the alley way could use them. Glasshouse is contributing glass art valued at $25,000 for the art panels. Art on the art panels will change periodically. In the future, Davis Smith said the team could build a locked enclosure for the art panels, allowing them to display more fragile pieces. Panels would hang on a rail in the alley. Davis Smith said this gives the team the option to add more panels later. The Alley Art Project will be reviewed by the Pioneer Square Preservation Board at a meeting July 7. It also needs to be reviewed by the Seattle Department of Transportation and is awaiting a building permit, Davis Smith said. Once those approvals are done, the project will go out for bid. Vogel said it will likely take a month to fabricate and install the panels. For more information, visit http://www.alleyart.org.